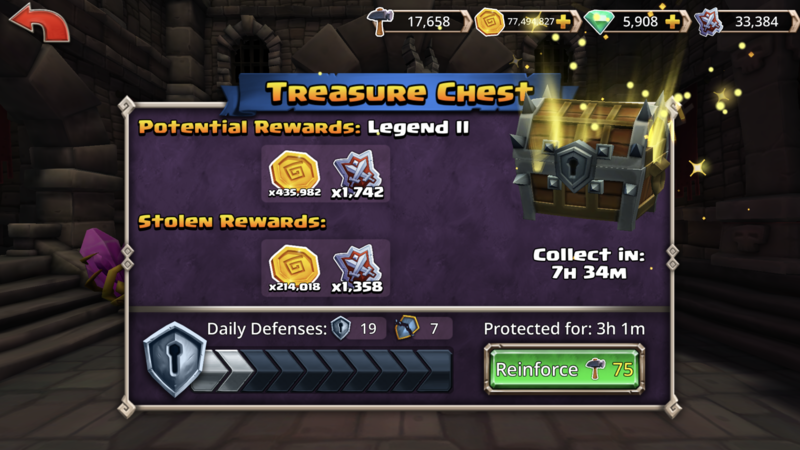 There is something wrong with the treasure chest daily defense, I have been spending a lot of hammers to protect it and still as you can see I lost gold and worse of all honor tickets! Please do something about it. There are so many more bugs this time around, that it’s not an enjoyable experience at all for me. Joel conveniently left out that while event tickets are fixed, trophy count will now be bugged. Joel is out today and it's taken a little while to get my account working correctly. We had an issue with some of our servers in the early morning until about 10am CDT. The downside was that these servers manage PVP Seasons and various search functions like Matchmaking and searching for Friends or Guilds. Depending on which server was controlling your action at a given time, the game could've been "out of Sync" related to any of the items I mentioned above. Obviously no one cares if they were shown bad friend or guild choices but PvP Seasons is obviously the big issue. As such Trophies you thought you had were not verified and hence not granted. There is no legitimate way to make things right. I wish we could, we tried but it just cant be done. On the "good" side, the Guild Grand Tourney leaderboards run on a different system and were unaffected. We will send out some compensation for this. I don't know what it is yet (sounds like don't give raid tickets) but will work to get it out ASAP.